The 5th Annual Reforestation Festival 2013 was coordinated by Yayasan Bali Hijau Lestari on Sunday 1st December 2013 from 7.30am - 2pm. Bali Hijau Lestari invited volunteers to participate in planting 3,500 trees, a mountain clean-up, community gathering and some outdoor fun. A meal wasprovided. The gathering point was Pura Jati - Toya Bungkah, Kintamani, Bali. Coordinator of directions was Fahri on 085 739 250 667. Yayasan Bali Hijau Lestari’s aim is to coordinate and foster reforestation and conservation activities in Bali, in order to develop Human Resources by those who care about the state of the island’s natural riches and the quality of the environment. Develop community capacity in the field of natural resource management based on the conservation and saving of the environment. Actively participate in environmental protection, especially through afforestation and reforestation activities. Develop public awareness in environmental conservation efforts. Actively participate in the greening of the island of Bali as a Tourist Destination Island. Ensuring the sustainability of water as a basic necessity of life. 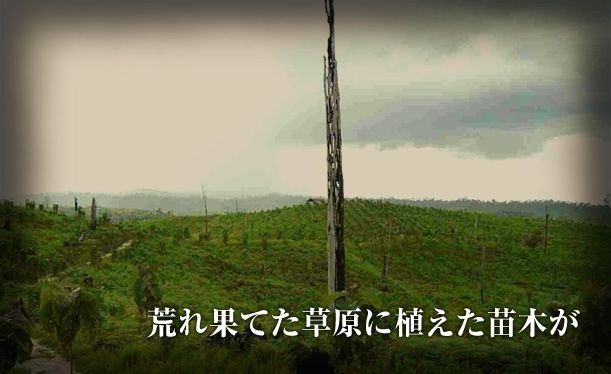 The first Reforestation Festival of any significance was conducted in the rainy season 2009 – 2010. Until March 2009, Yayasan Bali Hijau Lestari (YBHL) in cooperation with NPO Asian Green Forest Network (AGFN) Japan planted 10,840 trees in Kintamani conservation forest. Participants were Bali Japan Club, Japanesse Community in Bali, RRI Denpasar, RRI Singaraja, SMAN 1 Kintamani, SMAN 1 Tampaksiring, Indonesian Red Cross Bangli Branch and the native community around the conservation forest. Trees planted in the 2010 festival were in Ampupu (2950), Suar (350), Sonokeling (800) Gmelina (1550), Kemiri (50) and Jempinis (300). In the next months until February 2010, as many as 6,000 trees were planted. Bali has failed to achieve its target of planting 8.5 million trees on 21,031 hectares in a massive reforestation campaign. The campaign is part of a national program of planting 1 billion trees launched by President Susilo Bambang Yudhoyono last year. Bali Province has so far only managed to plant 724,700 trees, or 8.4 percent of the target set for the February 2011-January 2012 period, said I Gusti Ngurah Wiranatha, head of the provincial forestry agency. He blamed the weather for the failure, claiming that many regions of Bali had not experienced the rainfall normally expected. “The problem is that the rainy season has yet to arrive throughout Bali. If we plant the trees, we’re worried that the trees will die,” he said on the planting of 1,000 trees on parched land in Tulamben village in Karangasem regency. “We have only planted in Tabanan, Jembrana and Bangli, and in some parts of Karangasem.” Tree planting was prioritised in areas with a high intensity of rain. Tree planting is carried out in forested areas and previously unforested areas on lands belonging to local people. On such land, the planted trees are mostly those which have an economic value so as to encourage people to take care of them. “We are hopeful that the planting will achieve beneficial results and reach at least 80 percent of the target,” Wiranatha said. Pak Wiranatha said that Bali would make greater efforts to meet the target of planting 8.5 million trees. 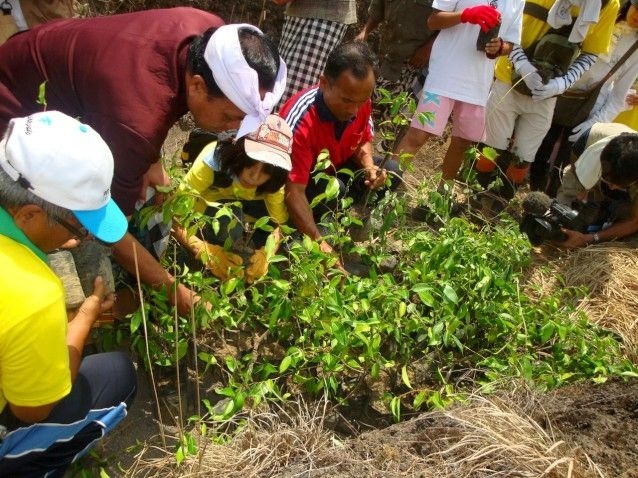 Bali Governor Made Mangku Pastika, who led the tree-planting campaign in Karangasem that year, hoped people would be more aware of the campaign and participate in the planting of 1 billion trees. Regent of Karangasem, Wayan Geredeg said people in the regency, where most of the land was relatively barren, were now more aware of the economic and environmental benefits of planting trees. Reforestation is the natural or intentional restocking of existing forests and woodlands that have been depleted, usually through deforestation. Reforestation can be used to improve the quality of human life by soaking up pollution and dust from the air, rebuild natural habitats and ecosystems, mitigate global warming since forests facilitate bio-sequestration of atmospheric carbon dioxide, and harvest resources, particularly timber. The term reforestation is similar to afforestation, the process of restoring and recreating areas of woodlands or forests that may have existed long ago but were deforested or otherwise removed at some point in the past. Sometimes the term re-afforestation is used to distinguish between the original forest cover and the later re-growth of forest to an area. A debatable issue in managed reforestation is whether or not the succeeding forest will have the same biodiversity as the original forest. If the forest is replaced with only one species of tree and all other vegetation is prevented from growing back, a monoculture forest similar to agricultural crops would be the result. However, most reforestation involves the planting of different feedlots of seedlings taken from the area, often of multiple species. Another important factor is the natural regeneration of a wide variety of plant and animal species that can occur on a clear cut. In some areas the suppression of forest fires for hundreds of years has resulted in large single aged and single species forest stands. The logging of small clear cuts and/or prescribed burning, actually increases the biodiversity in these areas by creating a greater variety of tree ages and species. Reforestation, if several native species are used, can provide other benefits in addition to financial returns, including restoration of the soil, rejuvenation of local flora and fauna, and the capturing and sequestering of 38 tons of carbon dioxide per hectare per year. The re-establishment of forests is not just simple tree planting. Forests are made up of a diversity of species and they build dead organic matter into soils over time. 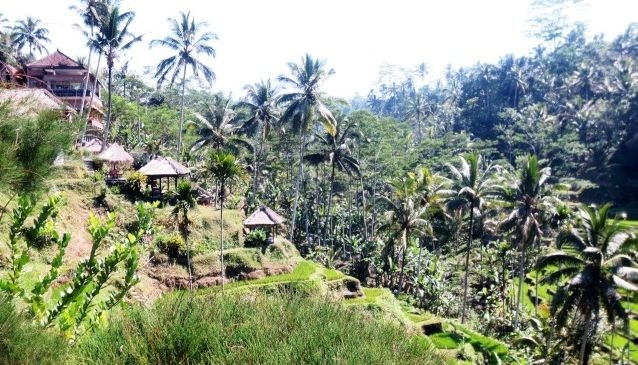 A major tree-planting program in a place like Bali would enhance the local climate and reduce the demands of burning large amounts of fossil fuels for cooling in the summer. Reforestation is needed because huge areas of forest are being damaged or destroyed around the world on a daily basis. Some estimates suggest that an area of forest equivalent in size to 36 football pitches is lost every minute. This deforestation has a number of causes, including fires, the clearing of land to make way for agriculture or human settlement, logging, mining and climate change. Forests are very important for a number of reasons and deforestation is a serious problem which affects us all. As well as being home to a huge and diverse range of animal and plant species, forests provide livelihoods for a vast number of people around the world and are a source of paper, timber, food and the ingredients of many other products, such as medicines and cosmetics. 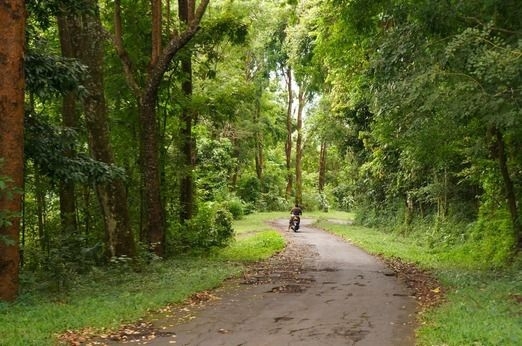 Forests are also vital for the health of our planet, maintaining the water cycle, preventing soil erosion and absorbing and storing enormous amounts of carbon dioxide which helps to limit the effects of climate change. In order to tackle deforestation there are a number of organisations around the world that aim to replant trees and help to regenerate and restore forest habitats. For more on reforestation, see the Arkive topic, Earth Day's Canopy Project and Greenpop's website.